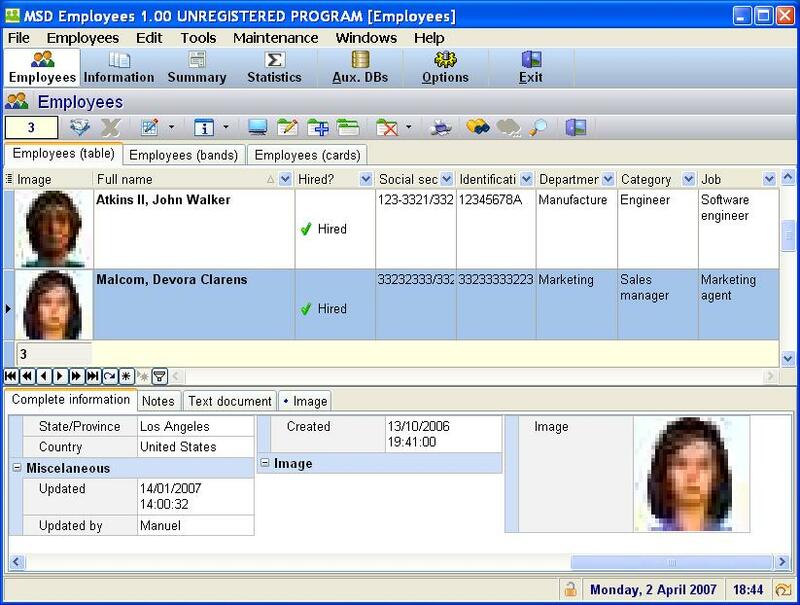 MSD Employees is a complete and easy to use employees information manager. It manages relatives, history, documents, qualifications, courses, certificates, knowledge, experience, contracts, salaries, fringe benefits, absences and holidays, delays, overtime hours, congratulations, warnings and sanctions. MSD Employees provides a data management first class technology. It allows to sort, group or filter the information by any field. ...... of a color to each type of absence. Thanks to the labor calendar that the program provides, it calculates the natural days and the workable days of every time period. Statistics: this module displays a table that shows the number of records that each employee has in the previously described databases. Among other things, you will be able to know what employees have more sanctions, more documents, more delays, more holidays, etc. Reports: this module displays several tables with important information about employees: contracts, salaries, absences, delays and overtime hours. Expiry dates: this module displays a table with the items with expiry dates already expired or close to expire: work permit, equipment, certificates, contracts, salaries and fringe benefits. Qweas is providing links to MSD Employees 3.20 as a courtesy, and makes no representations regarding MSD Employees or any other applications or any information related thereto. Any questions, complaints or claims regarding this application MSD Employees 3.20 must be directed to the appropriate software vendor. You may click the publisher link of MSD Employees on the top of this page to get more details about the vendor.